Best Exhaust for F150 Ecoboost: 5 Top-Rated in April 2019! Exhaust systems are a series of pipes that take the exhaust gases expunged from the combustion cylinders through the manifold head and out to the air. 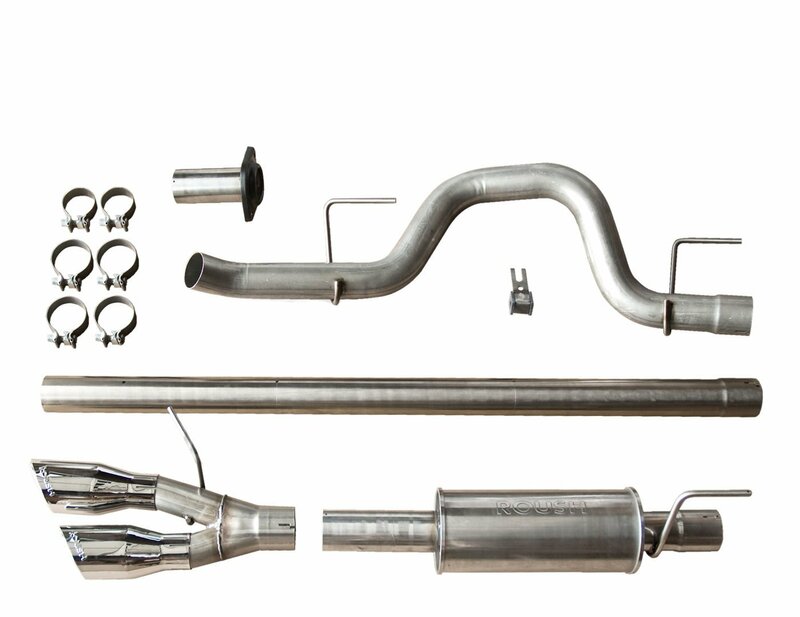 Most exhaust systems come with various configurations of the header or intermediate pipes, crossover pipe, catalytic converter, mufflers, and tailpipes. 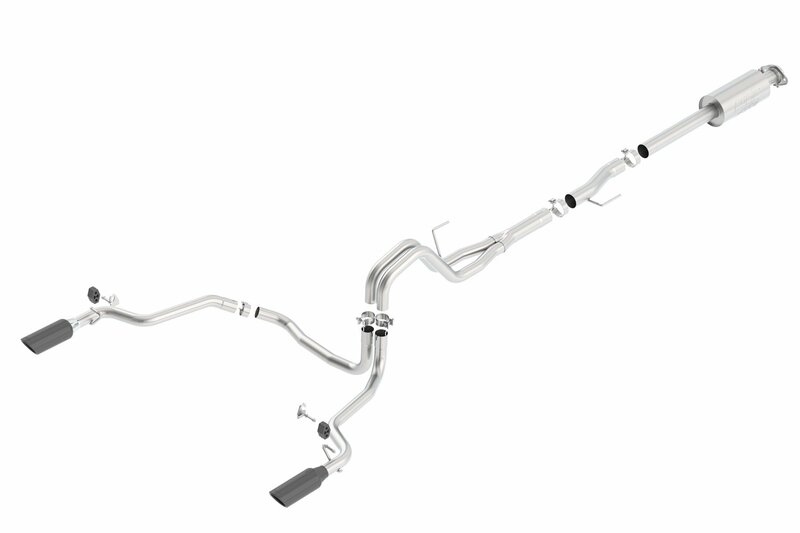 This is the Borla® 140616 ATAK™ Stainless Steel Cat-Back Exhaust System with Split Rear Exit. This is a Cat-Back exhaust that is made of stainless steel and delivers an aggressive and loud sound. 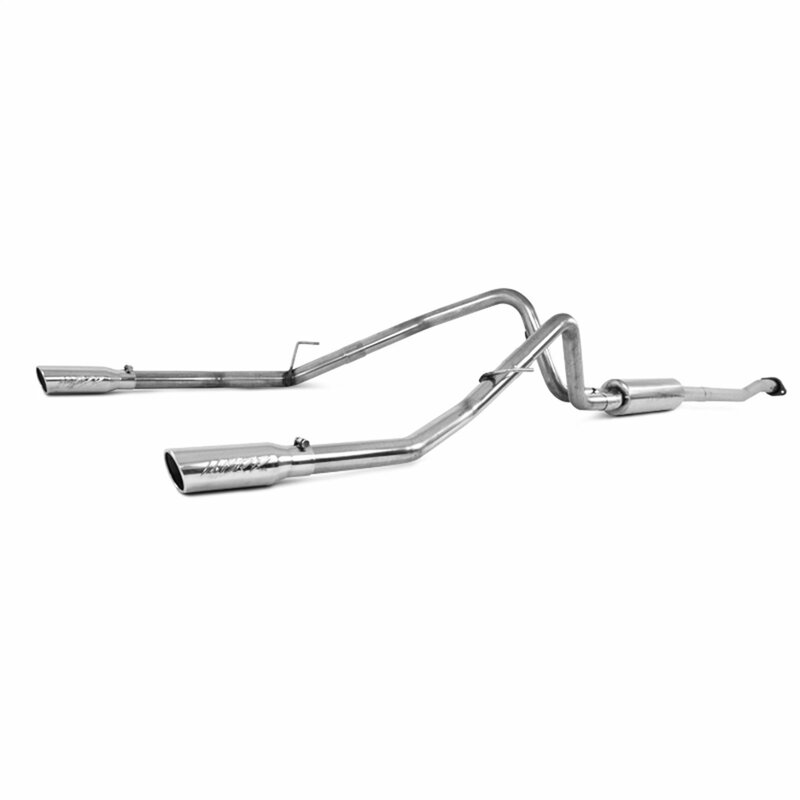 The main exhaust tubing is 3” and includes a straight-through, multi-core ATAK muffler with mandrel-bent exhaust tubes. The rear is split, and comes with a 12” long round rolled polished stainless steel 4” diameter tip. 2015-2018 F-150 2.7L/3.5L V6 EcoBoost (except Raptor and 5.0L V8 Automatic 2WD and 4WD drive. Extended Cab, Standard 78.8″ Bed, Crew Cab 67.0” Short Bed, and 145″ Wheel Base). If you want that aggressive muffler sound, and like to be heard before you appear, this is the exact model you want to install. This is a top grade polished model that comes with a hefty price; it is a performance muffler for performance upgrades. This model comes with the aggressive sound of a classic Roush exhaust system because removed the restrictive factory resonator, and installed a canister-style muffler with 3” exhaust piping. This stainless-steel system comes with a polished muffler, outlet pipe, and y-pipe, and the dual tips are made from 304 stainless steel and embossed with the Roush logo. The pipes are made of mandrel bent 409 stainless steel, and the muffler, inlet, and outlet pipes are 3” diameter. 409 Stainless Steel Muffler, inlet, outlet, and y-pips. This model is a budget-friendly replacement exhaust system that delivers excellent sound and great performance at a very good price. This is a classic stock replacement item that comes with good performance ratings and a medium to an aggressive sound. When installing this model, you are not changing the way your ride looks, and retain the same design but add additional sound performance for your enjoyment. This model is a cat back system that comes with a 3” diameter 16-gauge mandrel bent stainless steel tubing. It includes the American Thunder muffler model, with a 3” dual tip finish. While the price is slightly steep for a stock replacement model, Flowmaster is a brand name that provides quality and performance that is hard to beat, so this is the best stock replacement model for a middle sound upgrade. This is the Borla® 140616BC ATAK™ Stainless Steel Cat-Back Exhaust System with Split Rear Exit. The BC version of the 140616 comes with identical parameters but comes with a different tip finish that raises the price slightly. As such, this Cat-Back exhaust is made of stainless steel and delivers an aggressive and loud sound. The main exhaust tubing is 3” and includes a straight-through, multi-core ATAK muffler with mandrel-bent exhaust tubes. The rear is split, and comes with a 12” long round rolled polished black stainless-steel angle cut 4” diameter tip. 2015-2018 F-150 2.7L/3.5L V6 EcoBoost (except Raptor and 5.0L V8 Automatic 2WD and 4WD drive. Extended Cab, Standard 78.8″ Bed, Crew Cab 67.0” Short Bed, and 145″ Wheel Base. This BC version system comes with a polished angle-cut black tip finish that adds a little bit more spice to your upgraded exhaust system look feel and sound. When it comes to economic replacement parts with style, then the MBRP S5240409 is your classic kit. This model is made of T409 stainless steel 2 .5” tubing and fits Ford F150, V6 EcoBoost 2011-2014 applications. This cat-back model comes with a T304 stainless-steel 3 ½” OD Tip, and the hangers are welded onto the T409 stainless steel pipes and frames. While it is a budget-friendly model MBRP didn’t hold back on performance improvement features, as such, this attractive exhaust delivers slight improvements in torque and HP while reducing fuel consumption to by 1 to 2 mpg. A great buy if you are into stock replacement parts with slight performance improvements on a string budget. 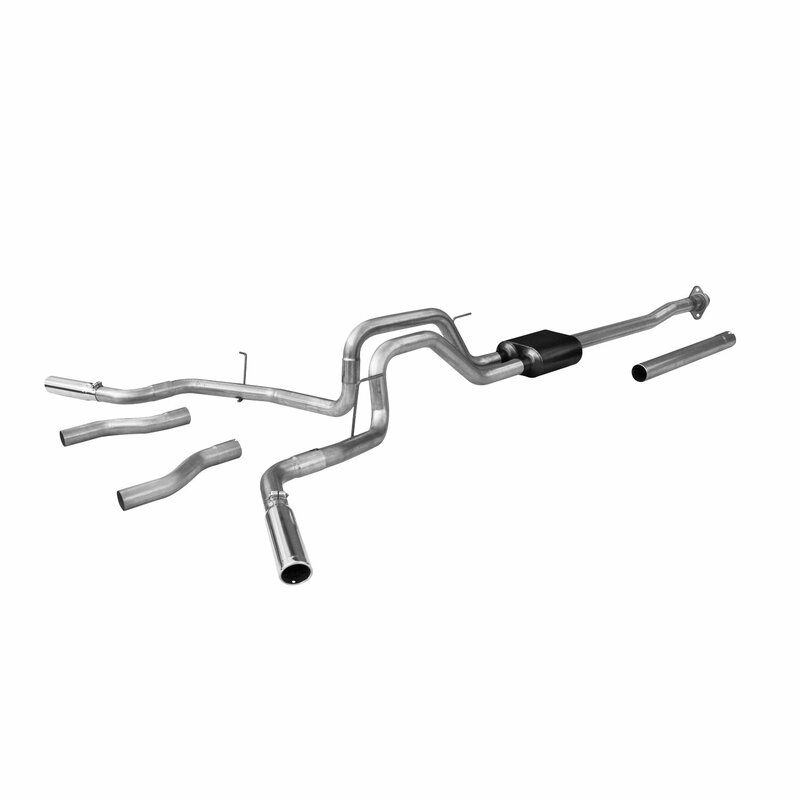 There are three main types of exhaust systems on the market; these are header-back, cat-back, and axle-back. This provides a complete replacement for every component from the engine header to the tailpipe. These systems provide more flexibility in design, and you can enlarge the diameter of your entire exhaust system for greater exhaust gas flow. These models are more expensive and harder to install than other systems. These models start the exhaust replacement sequence form the catalytic converter back. They generally come with a replacement muffler and tailpipe; some kits come with a mid-pipe, X-pipe, H-pipe or a Y-pipe. These are the most popular upgrades and replacement kits since they are budget-friendly, easy to install, provide a state legal replacement from the catalyst, and deliver deeper and more aggressive tines. These are the classic stock replacement models that come with the components to connect from the rear axle to the tip. They provide better performance than standard stock replacement models and are the easiest and cheapest to install. Some models deliver performance sound. There are also two configuration options, a single or dual exhaust. These are the common models and provide a single tube, muffler to tip tubing. These are lighter and less expensive than the dual exit models. 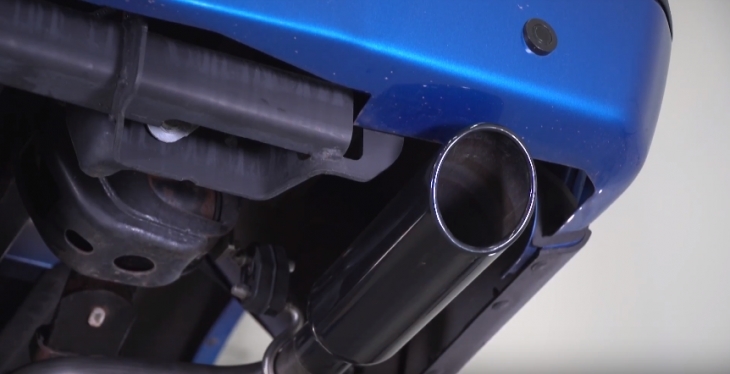 These use the same components as a single exit system, they come with one headpipe, converter, and muffler, but end with two exhaust tips rather than one. When it comes to the aftermarket scene, true dual exit exhaust models are the most popular, these literally come with two of everything, and they run from the header to the back on either side of the vehicle. Obviously, these kits provide a sporty look and deliver a distinctive growling sound generated by the two mufflers. The only issue with a true dual exhaust system is the imbalance between the two components that can lead to cylinder head issues that reduce HP. To combat this, a crossover pipe is installed that lets the gasses from both sides mingle, and create a single pressure flow for both systems. The two materials you will find are either miss steel or stainless steel. Mild steel needs to be coated to prevent corrosion and is an inexpensive material. Stainless steel is less corrosion-prone and more expensive. 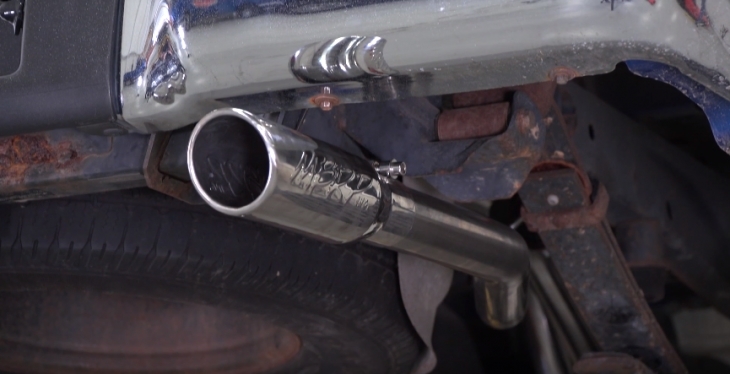 Changing an exhaust is relatively simple unless you get a header back system that requires you connect it from the header (or manifold in turbocharged models) to the tail. There are two ways to replace the exhaust either lying down, or standing up, and that’s dependent on the jack you have. If you have a good floor jack with support beams, then you do it standing up, and the operation is much quicker. Whether standing or lying down, prepare the parts in the order of installation, and have all the hardware and tools ready. Perform a dry test and connect the new system to see all the parts fit together, you don’t want to start and find out you have a mismatched component in the middle of the change. Start by unbolting the old exhaust system from the back work towards the front. Remove all the parts, and keep the hangers just in case you need extra from the hardware you have. Start by placing the new hangers into their place. Once all the hangers are in place, you start from the front of the vehicle and hang all the exhaust components. Bolt the upstream pipe into place, but don’t torque it yet. Now connect all the parts, and once all connected, go back to the front. Torque all the parts into place.